Marzipan "Olives" for sale. Buy online at Zingerman's Mail Order. Gourmet Gifts. Food Gifts. Home > More > The Great Unknowns > Marzipan "Olives"
This is one of the more whimsical gifts you can offer a foodie with a sweet tooth. Fear not: these aren't actual olives. Made from Sicilian almonds and pistachios, the confectioners at Bonajuto in Modica, Sicily create marzipan that they form to look like olives. 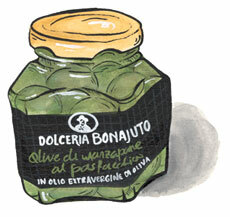 The "olives" are stored in extra virgin olive oil, a perfect way to balance the sweetness of the marzipan. Simply remove the olives from the jar and set out with coffee or whenever you need a little sweet pick me up. Eye catching and totally delicious.